Are Turkey’s Orthodox Christians Waiting for Godot? The memorable play of Irish author and playwright Samuel Beckett, “Waiting for Godot,” has become a metaphor for situations in which people wait for someone unlikely to come, or do not even know what they are expecting. They just keep waiting and waiting. The handful of Orthodox Greeks left in Turkey appear to be waiting for Godot, too, caught in a very typical Turkish situation. The Theological School of Halki, which is attached to the Ecumenical Patriarchate, has been closed down since 1971. Almost every day for the past 42 years, the Orthodox community has been anticipating the news of the school’s re-opening, but to no avail. To understand why the anticipation has become so exhausting and frustrating, one has to look back through history and comprehend the significance of the seminary to the Orthodox community. Named after the island of Halki in the Marmara Sea, where it was founded in 1844, the school used to train clergy to meet the needs of not only Turkey’s Orthodox community but also hundreds of churches across the world affiliated with the Ecumenical Patriarchate. By the time it was shut down in 1971 under a ruling by Turkey’s constitutional court, 930 clergymen had graduated from the seminary. Twelve of them eventually became patriarchs, meaning that almost all patriarchs have been graduates of that school. Hence, the seminary was not just a theological school, but also an important milestone on the way to the spiritual helm of the Ecumenical Patriarchate. The school’s closure cut a lifeline of the Patriarchate and forced it to struggle for its very survival. The collapse of the Ottoman Empire and its succession by the Republic of Turkey marked the beginning of the long road that eventually led the Ecumenical Patriarchate into its current predicament. Throughout the republic’s history, the Patriarchate has seen an array of its properties confiscated and endless red tape, all intended as pressure to force it out of Turkey. In the eyes of the republic’s founders, the Patriarchate was an “enemy within” that had collaborated with the foreign occupiers of Istanbul in the wake of World War I. The negotiations that led to the signing of the Lausanne Treaty, Turkey’s founding document, reveal that moving the Patriarchate out of the country was an essential Turkish objective. In the end, the Turks grudgingly accepted that the Patriarchate would stay, but object to any moves to regenerate the institution. The closure of the Theological School of Halki was a watershed in efforts to suffocate the Patriarchate. It was based on a 1971 ruling by the constitutional court, which annulled provisions in the Law on Private Educational Institutions (Law No. 625) that had made it possible to run private institutions of higher education. The reason the 1965 law was deemed unconstitutional six years after it took effect was undoubtedly political. Tensions ran high in those years between Turkey and Greece over the Cyprus conflict. By issuing the ruling that would lead to the closure of the Halki school, the constitutional court had laid the ground for Turkey to make a retaliatory move. Articles 40 and 42 of the Lausanne Treaty clearly oblige Turkey to grant equal treatment to non-Muslims and facilitate their religious affairs and worship services. Thus, the closure of the seminary was yet another violation of the Lausanne Treaty in Turkey’s treatment of its non-Muslim minorities. 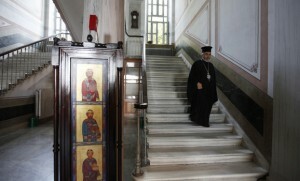 Ever since then, the Orthodox community has eagerly awaited the re-opening of the school. Optimism has grown since the Justice and Development Party (AKP) came to power in 2002, pursuing perhaps the friendliest policies regarding minorities in the history of the republic. The AKP has never said it will not re-open the school. On various occasions — both public and behind closed doors — officials have asserted that the school could be re-opened. Those encouraging statements go back to 2003 when Huseyin Celik, then-education minister and AKP heavyweight, said that the seminary should be re-opened. As Turkey’s ally, the United States has taken every opportunity to urge Ankara to re-open the school. In 1999, President Bill Clinton visited the school and told his counterpart Suleyman Demirel that it ought to be re-opened. In various resolutions since 2002, the US Congress has issued similar calls on Turkey. When President Barack Obama addressed the Turkish parliament in 2009, he also emphasized the importance of re-opening the school. Not only the United States, but the European Union and an array of European countries, too, have urged Turkey to re-open the school. Erdogan and his government may be critical of the Kemalist state mentality, but we know that when it comes to certain fundamental issues about non-Muslim minorities, they act with nationalist instincts. Another point hard to understand here is why the Patriarchate is standing by so passively. Why is it not taking legal action in the face of this flagrant injustice, while it has repeatedly taken Turkey to the European Court of Human Rights over confiscated properties — and succeeded? This question is perhaps one of the most difficult to answer. Instead of resorting to legal means, the Patriarchate is insisting on trying the same methods that have already proved to be utterly ineffective, believing that “foreign pressure” will induce Turkey to re-open the seminary. The fact that on April 30 the US issued yet another appeal to Turkey to re-open the school upon the initiative of Gus M. Bilirakis is an illustration of how the vicious cycle. The Ecumenical Patriarchate will continue to wait for Godot as long as it relies on futile foreign pressure and holds back from seeking its rights through legal means.